You gain 34,999 points [?] Loyalty program points By purchasing products included in the loyalty program, you gain points, which then can be exchanged to other products available in the store or for a permanent discount. Only available to registered customers. It's a ThinkPad – will it do the thinking for you? At first glance, Lenovo's new L440 from the ThinkPad line looks well-built and seems rigid as expected. Find out in our test report whether the laptop can live up to this first impression, and whether it can compete on the market in terms of performance. There is not much to be said about Lenovo's ThinkPad series (formerly made by IBM). These devices have been available for over two decades, and can probably be counted to the founding devices of compact business laptops. After all, we do have a few ThinkPad reviews in our repertory. Our current Lenovo ThinkPad L440 (model 20AS-001CMZ) features the new Intel Core i5-4330M CPU alongside the integrated HD Graphics 4600 GPU, 4 GB of working memory, a 500 GB hard drive, and a 14-inch HD screen. Interestingly, the L440 models presently listed in German online shops are all based on Intel's i5-4200M CPU. Its performance reserves are a bit lower, as can be read in the following sections. Potential contenders are found among the entry-level business devices, for example from Dell, Fujitsu, and HP. 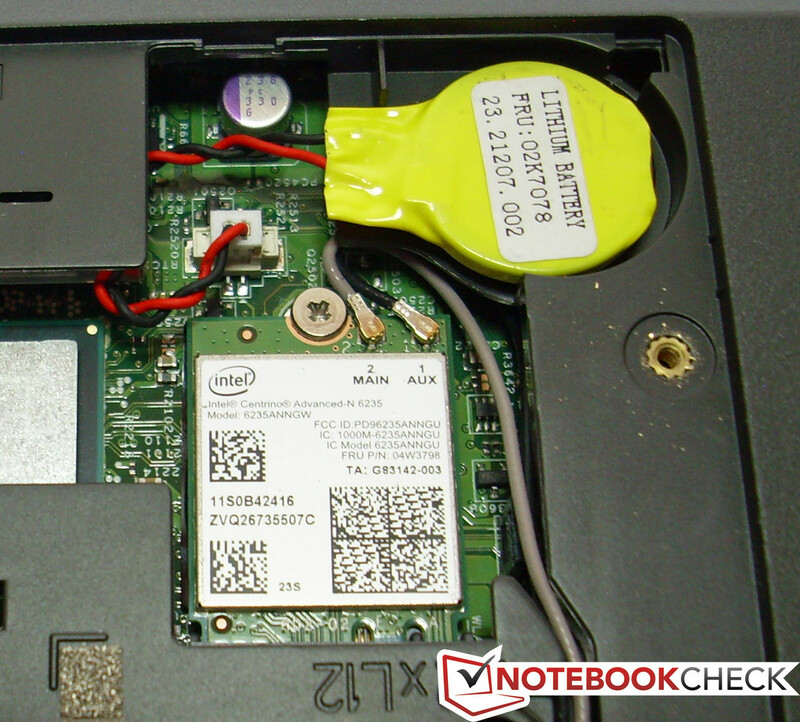 Notebookcheck has previously reviewed Fujitsu's LifeBook E743 and Dell's Latitude 3440. Both are offered in various configurations, and are roughly within the same price range. HP positions its ProBook 640 G1 here, which we have not yet tested. 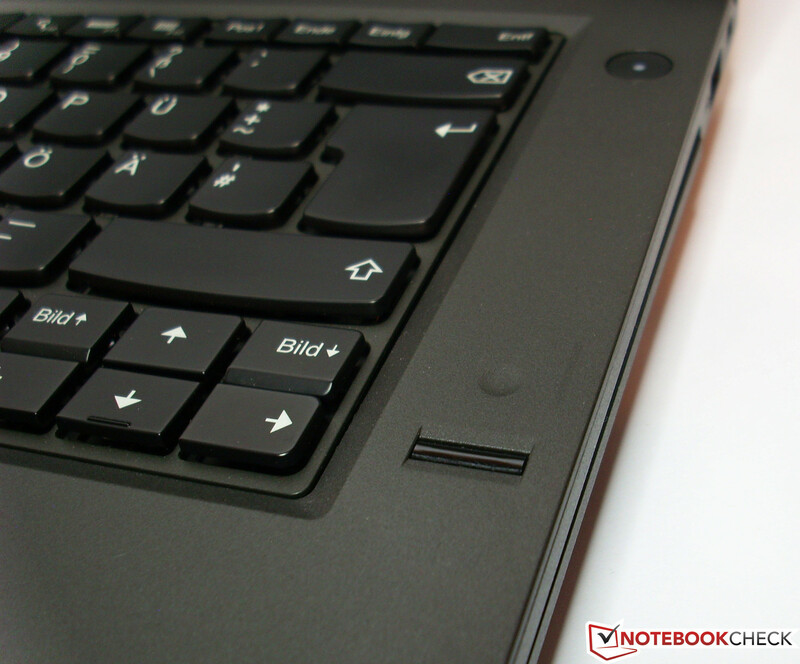 The casing of Lenovo's ThinkPad L440 is made completely of matte-black plastic with a very finely roughened surface. This unfortunately also makes it look like "just" a solid work device, and does not convey the slightest hint of elegant design. The only eye-catcher is the ThinkPad logo on the lid's back. The i's dot lights up when the laptop is on, and blinks in energy-saving mode. 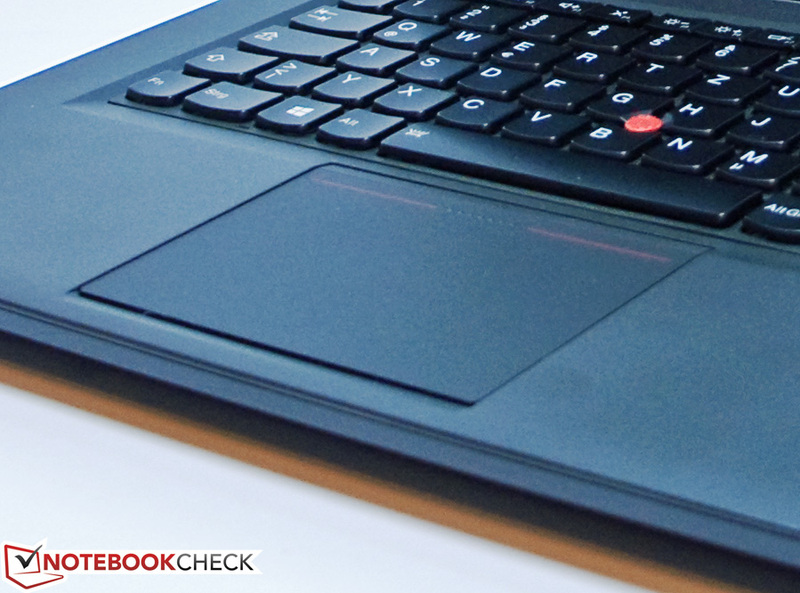 Basically, the laptop's entire appearance is simply typical ThinkPad. Stable hinges keep the display in position, and the latter can be opened generously up to an angle of 180° to the back. Our review sample's lid does not close quite flush with the base unit though. The screenshots clearly show how the gap gets bigger toward the front. This will likely not be disturbing because the plastic is pliable enough to not break. However, this should be mentioned considering the device's price range. Except for this point, the other parts are well-manufactured. The ThinkPad L440 has a VGA-out, which will certainly be useful for some projectors, and a mini-DisplayPort. An HDMI port is not installed. There is also only one powered USB 3.0 port, and 3 USB 2.0 ports. The other way around would likely be more appreciated nowadays. An SD card reader is also available for fans of digital photography. It is well-hidden on the front, lower right side. A combined 3.5 mm headphone-out and microphone-in jack is installed for audio peripherals. In addition to the integrated Wi-Fi module, a 1000 megabit/s (Gigabit Ethernet) BASE-T network socket (RJ45) is available. Besides that, there is also an ExpressCard and/or SmartCard slot in the laptop. The state-of-the-art Advanced-N 6235 Wi-Fi module from Intel's Centrino line is used in the ThinkPad L440. It supports the Wi-Fi 802.11 a/b/g/n standard, and dual-streams (2x2). This enables transmission rates of up to 300 Mbps. Besides that, it supports dual-band, and can be used in both the 2.4 GHz and 5 GHz mode. That also contributes to speed, among other things, and can thus reduce possible data congestion. The 5 GHz band also has the advantage that it is not (yet) as busy, and thus contains fewer sources of interference. The connection was tested using 2 routers; one was located in the laptop's direct vicinity (approx. 2 meters), and the other was two stories above the workplace (approx. signal strength: 50-60%). There were no problems with the Wi-Fi reception in either case. The Ethernet adapter is also on a good level with 1000 megabit/s (Gigabit Ethernet). Intel's Centrino module also supports Bluetooth 4.0. A light-sensitive HD webcam with a wide-angle range and Face-Tracking from Vimicro Corporation, as well as two microphones with noise cancellation provide the necessary communication tools for web conferences. The camera shoots fairly focused pictures in the 720p mode, but they are partly very noisy especially in somewhat darker ambient light. It is not intended for making HD videos, and its performance is fully sufficient for communication usage. Thus, the camera serves its purpose. Face-tracking works very well. An activity LED indicates whether the camera is on. Not many accessories are included for the ThinkPad L440. The review sample only included a quick-start poster, and a card of recommendation for Lenovo-branded laptop bags. The ThinkPad L440 is delivered with Windows 7 (64-bit) installed. A Windows 7 DVD is not included; instead a partition dubbed Lenovo Recovery is on the internal hard drive. The system can be reset via the included Lenovo ThinkVantage Tools software. This tool also enables creating a backup of needed files on an external data carrier, which is certainly recommendable. After all, a hard drive could take damage. 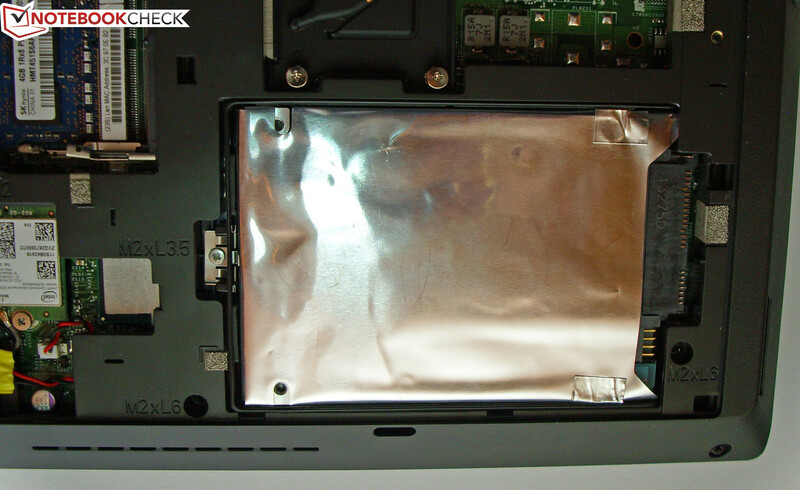 The ThinkPad has a relatively large maintenance cover for accessing the inner components. Besides the four screws that have to be removed, there is also an additional fixture system comprised of plastic clips (for no evident reason). They make it difficult to open the cover without accidentally damaging them because they are virtually predestined to break here. In any case, the user should attempt this very carefully so to not break the plate or clips. Thus, it would be better to not open the laptop when it is not absolutely necessary. Should this, however, become necessary, it would be advisable to download the corresponding Hardware Maintenance Manual (42.2 MB!) 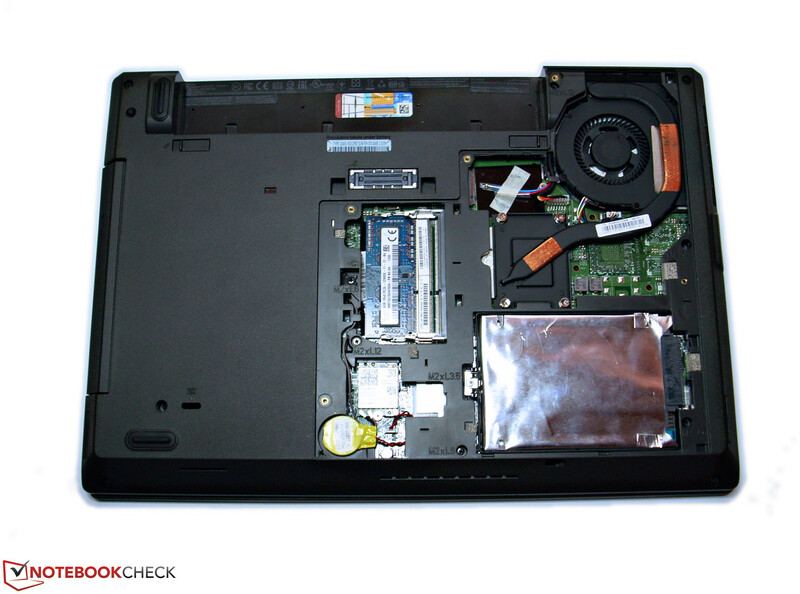 from Lenovo's website, where this procedure is illustrated. Unfortunately, the exact location of these clips is not depicted. The user can access the hard drive, working memory, Wi-Fi module, and BIOS battery when the cover is removed. The latter is easy to replace because it is only inserted via a connector, and not soldered. 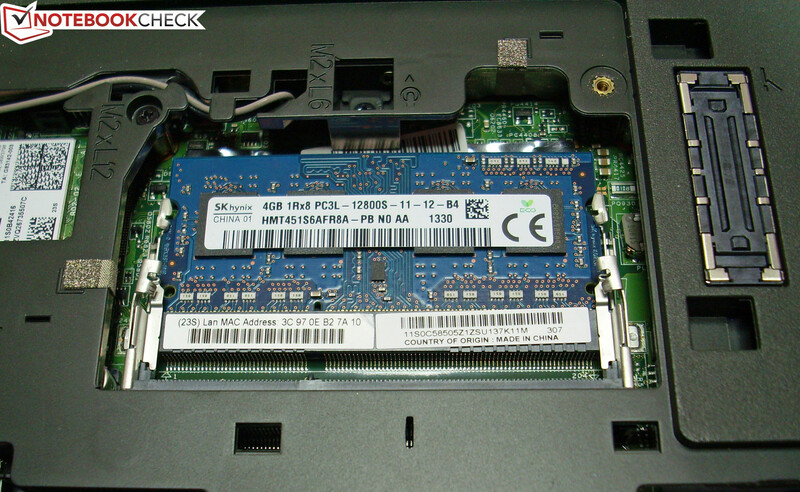 The ThinkPad L440 features two easy-to-access working memory banks, one of which is furnished with a 4 GB module. 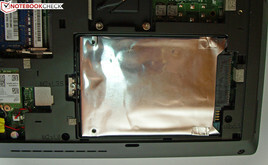 The hard drive can also be replaced easily (e.g. with an SSD). The size of the installed hard drive slot offers the usual space for 2.5-inch hard drives. A base warranty of 36 months is included on the laptop, and corresponds to the class standard. Warranty upgrades or extensions are optionally available. For example, Lenovo currently charges 81.60 Euros (~$111) for an upgrade to 48 months on-site service via the Internet. As to security, Lenovo's ThinkPad has quite a bit to offer. Besides the fingerprint scanner common in this category, there are other security and management features, such as Intel's vPro, Computrace, hard drive encryption, BIOS lock, Trusted Platform Module (TPM), and ThinkVantage Password Manager software. The Active Protection System (APS) for conventional hard drives should also be mentioned. This security mechanism detects strong shocks to the system (or even drops), and parks the hard drive's read head to protect stored data. 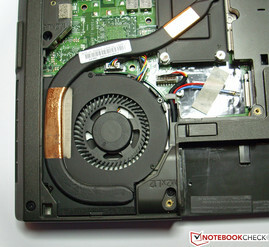 According to Lenovo's website, special tests similar to military standards were also performed with the laptop. A standard-sized, spill-resistant keyboard is used in the laptop (our review sample had a QWERTZ layout). It features a fairly long drop with a well-defined pressure point, and quiet stroke. The keys' surface is sleek (not roughened), and they are slightly concave. Typing quickly on the keyboard is very pleasant, and even some desktop keyboards cannot compete with it - definitely a bonus point. As good as the keyboard is the 100 x 75 millimeter touchpad gives reason for complaint. Here, one of the biggest modifications of recent years is found in form of the 5-key ClickPad. For example, the two dedicated touchpad, or mouse buttons have now been omitted. Lenovo has integrated them into the touchpad's surface so that the entire pad is now a button with an unusually high drop. Consequently, it feels a bit like a wobbly platform. Unfortunately, precise cursor control is only possible to an extent because the finger often "slips" away. Users who have only used a conventional touchpad until now will certainly find it very strange, and will need a bit of getting used to. However, this is not devastating for those who work with more sophisticated programs because they will likely connect an external mouse, and the red TrackPoint in the keyboard's center is another alternative for controlling the cursor. A 14-inch HD anti-glare screen with a native resolution of 1366x768 pixels (16:9 format) is installed in the ThinkPad L440. The screen's average brightness of 204.4 cd/m² is within an acceptable range. We also found a reference to an optional HD+ screen with 1600x900 pixels in various spec sheets from Lenovo. Fujitsu's LifeBook E743 that we tested also relies on an HD+ screen, but one that is much brighter. Our test sample of Dell's Latitude 3440 also features a bright HD+ screen. We would recommend the HD+ alternative of the L440 when importance is placed on a good overview, and working with multiple windows or larger spreadsheets. The contrast ratio of 655:1, and a black level of 0.323 cd/m² places the ThinkPad within a good field. Dell's Latitude E3440 accomplishes marginally lower results with rates of 438:1 and 0.78 cd/m². Fujitsu's E743 is on par with that. 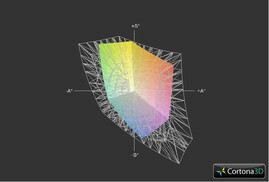 Unfortunately, the DeltaE 2000 shifts of many colors reached a rate of over 10. Only black and blue accomplished the target range of DeltaE < 5. 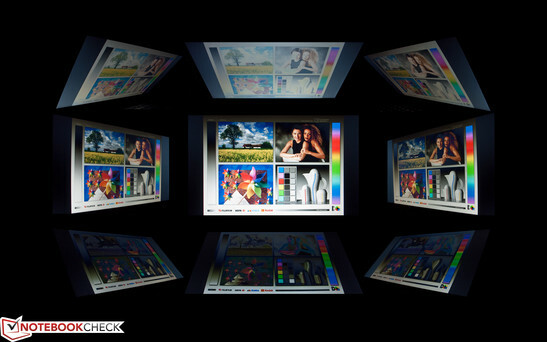 The screen in the ThinkPad L440 cannot fully reproduce either the sRGB or AdobeRGB color space, which should not discourage average users. The ThinkPad L440's viewing angle stability is not quite as good. The displayed image quickly loses brightness and contrast, which also unfortunately limits outdoor use to an extent. The expectations placed on the quality of a screen from this price range have thus not been satisfactorily fulfilled. The native resolution of 1366x768 pixels could also be a bit higher for a laptop from the business category. Like the contenders, the ThinkPad is not necessarily meant for photographers or graphic designers because the ascertained rates do not meet the professional demands in these fields. However, we did not determine outstanding color deviations using only our eyes. 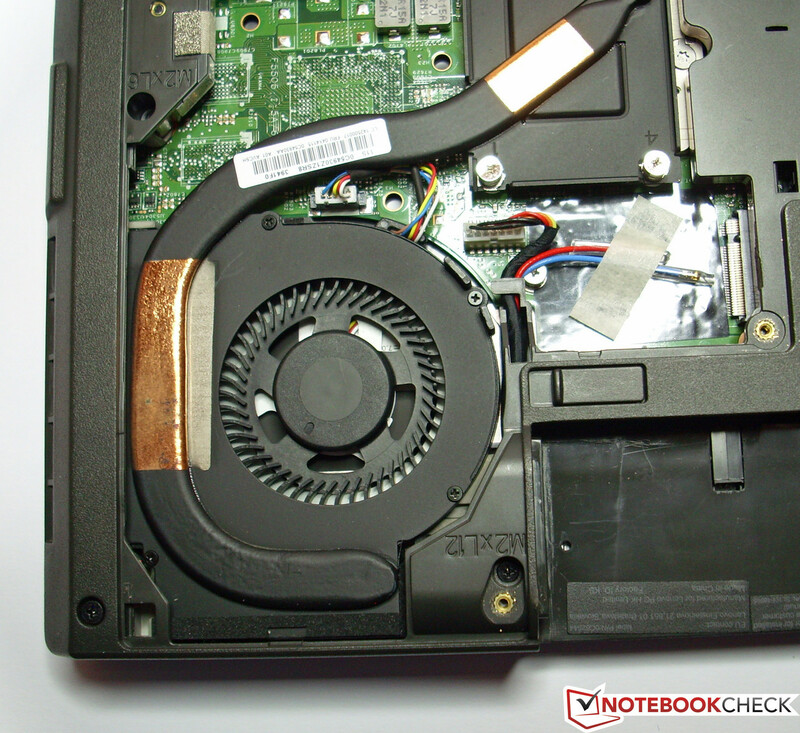 Lenovo clearly focuses on processor power and security in its ThinkPad L440. 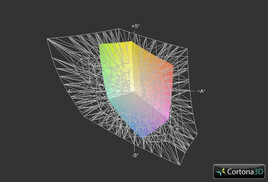 Intricate 3D games, however, do not quite belong to the laptop's intended application field. Since only one of the two working memory banks in the ThinkPad L440 is filled, the working memory only operates in single-channel mode. A considerably higher performance could be achieved by installing a second RAM module with the same memory capacity because the dual-channel mode would lead to a higher data transfer rate between processor and memory. Installing a solid state drive (SSD) would naturally also lead to a performance boost. All in all, the ThinkPad L440 is a reliable companion in the work world owing to its strong battery, many security features, and rigid casing, and has enough performance reserves for many tasks. A special highlight of our Lenovo review sample is certainly the swift Intel Core i5-4330M CPU that is based on Intel's new Haswell architecture, and built in 22 nanometers (TDP: 37 watts). This mobile dual-core CPU has a base clock of 2.8 GHz, but can achieve speeds of up to 3.5 GHz via Intel's Turbo Boost technology. The processor also supports Hyper-Threading, which enables both cores to process 4 threads simultaneously. The integrated Intel HD Graphics 4600 GPUtakes care of graphics work. Lenovo also offers the ThinkPad L400 with other processors. At the time of writing the preconfigured models available in Germany were all listed with an i5-4200M that clocks a bit slower (2.5 to 3.1 GHz), as the test configuration's counterpart. The chip achieved an excellent score in the Cinebench R11.5 single-CPU test, and places itself approximately on the same level as the current i7-4700MQ quad-core CPU. The i5-4200M lagged behind by about 10% in the same test. The advantage over the i5-4200U ULV chip that is currently often used is very clear with approximately 25% (Latitude 3440). The score in the Cinebench multi-core test is just as impressive. The chip advances to the top ranks of mobile dual-core processors. The 4200M again lags behind by approximately 10%, and the i5-4200U falls behind by about 30%.